4: rose from supper, laid aside his garments, and girded himself with a towel. 5: Then he poured water into a basin, and began to wash the disciples' feet, and to wipe them with the towel with which he was girded. 6: He came to Simon Peter; and Peter said to him, "Lord, do you wash my feet?" 7: Jesus answered him, "What I am doing you do not know now, but afterward you will understand." 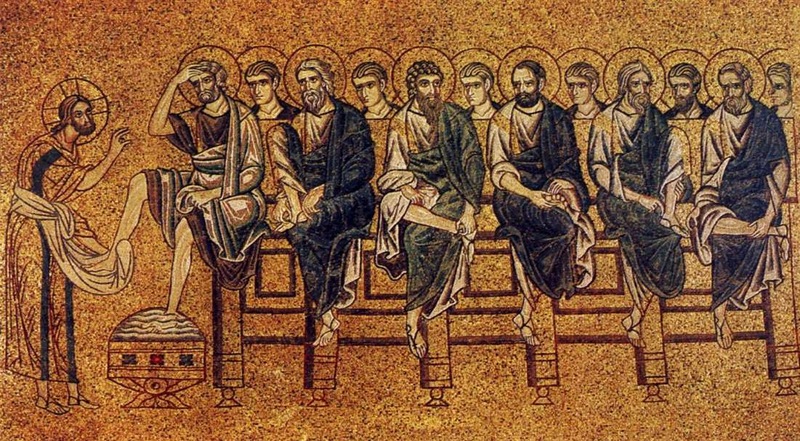 8: Peter said to him, "You shall never wash my feet." Jesus answered him, "If I do not wash you, you have no part in me." 9: Simon Peter said to him, "Lord, not my feet only but also my hands and my head!" 10: Jesus said to him, "He who has bathed does not need to wash, except for his feet, but he is clean all over; and you are clean, but not every one of you." 11: For he knew who was to betray him; that was why he said, "You are not all clean." 12: When he had washed their feet, and taken his garments, and resumed his place, he said to them, "Do you know what I have done to you? 13: You call me Teacher and Lord; and you are right, for so I am. 14: If I then, your Lord and Teacher, have washed your feet, you also ought to wash one another's feet. 15: For I have given you an example that you also should do as I have done to you. Divine Grace is dancing - fain would I pipe for you! All join in the dance! I have no resting place - I have the earth. I have no Temple - I have Heaven. To you who knock, a door am I. So on this sacred night we dance around the imago of Christ - the divine dance around which all creation moves. A divine dance that contains all - even the suffering and heartbreak of our existence.